Former Australian and current New Zealand MX1 champion Kirk Gibbs has been drafted to the powerful CDR Yamaha Monster Energy Team for the 2019 motocross season. With 2017 Australian No.1 Dean Ferris heading to the United States and Dylan Long’s contract not being renewed, CDR Yamaha boss Craig Dack had been on the lookout for two new riders to spearhead the teams’ 2019 campaign and he is pleased to reveal the signature of Gibbs for next season and is excited about what he brings to the team. “Kirk comes to us as an experienced racer with the qualities we look for in a professional rider. He is hard-working, dedicated and determined in character as well and talented and focused on racing. We believe surrounding him with the CDR Yamaha staff and on Yamaha machinery, we can elevate Kirk even further and look forward to a strong season from him,” Dack said. 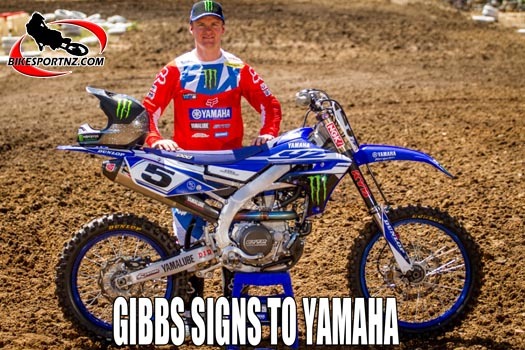 The 28-year-old Gibbs returns to Yamaha for the first time since 2011 and is elated to have secured a ride with the most successful motocross outfit in Australia. Gibbs has been a championship contender in the Australian MX Nationals since the 2013 season and highlighted with his Australian championship win in 2015. Despite suffering injuries in recent seasons, Gibbs still has the speed, fitness and now the experience to win at a national level and, with the CDR Yamaha team behind him, he thinks his chances of more championship success are better than ever. “I have only had some initial set up testing on the Yamaha YZ450F and already I feel I have a bike that I can ride well and suited to my style of riding. The power is smooth yet strong and the chassis feels really stable, so I feel we are well-placed already and really look forward to working closely with Craig and his team in 2019,” Gibbs said. The first assignment for Gibbs on his new Yamaha YZ450F is to again tackle the four-round New Zealand Motocross Championships, beginning with round one in New Plymouth on February 3, before embarking on his MX nationals campaign starting on March 17.